Pam Clarke, President of the Westhoughton Local History Group, has researched and written about adapting local engineering skills to gun manufacture in Westhoughton. John Musgrave & Sons Ltd., manufacturers of Lancashire boilers and long established in Bolton, chose Westhoughton as the location for a new factory to meet the needs of their expanding business. Construction of the works was reported to be in progress in August 1900 and production started on 19th February 1901. The first boiler left the works for Jacksons Flour Mill at Bolton during the third week of March, 1901. The works was situated not far from Westhoughton Coal & Cannel (sic) Company’s colliery, (known as Stott’s Pit), and a private branch line was built to connect with the Lancashire & Yorkshire Railway at Westhoughton Station. Musgraves ran into financial difficulty. Their Globe Works in Bolton and the new Westhoughton factory were put up for sale on 2nd July 1912, as a result of chancery judgement. On Friday, 9th July 1915, the Bolton Journal reported that the works of Messrs. J. Musgrave and Sons Ltd., had been acquired by the Admiralty. It went on to say that “the works are splendidly adapted for the purpose of gun-making etc., and it is anticipated that when the new operations are in full swing several hundreds of men will be employed. The naval authorities are already in partial possession of the concern, and in the course of a few weeks they will enter into full ownership. Messrs Musgrave employed at the Westhoughton works about 200 men in the manufacture of boilers. The work of removing the boiler-making machinery is progressing rapidly, and it is hoped that the works will be at least partially equipped for gun-making within a month”. The acquisition of these works by the Admiralty was of considerable importance to Westhoughton. Very few of Musgraves’ workers resided in Westhoughton, and for many years they travelled by special trains to and from Bolton. Most of these workers were absorbed by the Admiralty, and it was agreed that the workers should reside in Westhoughton, but due to the war, housing shortage became acute. A site was leased from the Vicar of Westhoughton; and the Council, under agreement with the Admiralty, which provided for a subsidy towards the Capital cost. There are 33 non-parlour houses, and 8 parlour houses, these were erected during the years 1917-18. The site is situated adjacent to Lord Street and The Avenue. The scheme was promoted during the war for the accommodation of persons employed at the R.N. Gun Factory, Westhoughton. The road in the centre of the estate was named ‘Jutland Grove’ after the battle of Jutland in 1916. 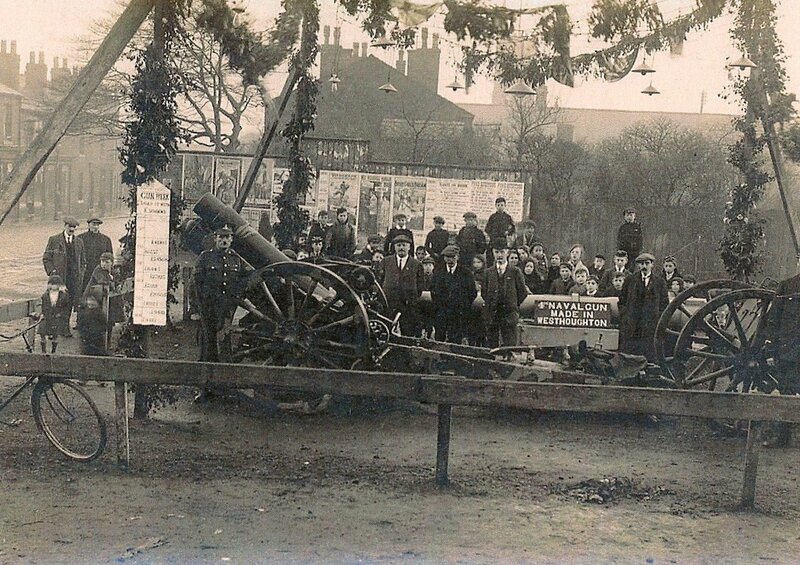 Little has been documented about the actual production of naval guns at the factory but this photograph taken on the Market Site in Westhoughton shows an exhibition for raising cash for the war effort (1914-18). On exhibition is a ‘Howitzer’ which was a long-barrelled field gun, this was the main support weapon for the British Army at the beginning of the WW1. At the cessation of hostilities, the factory closed in 1919 and was dismantled in the 1920’s. by Pam Clarke, President & researcher for Westhoughton Local History Group.